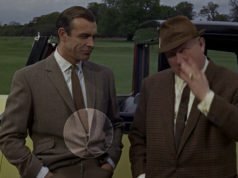 From Russia With Love is where Fleming writes his famous remark about the Windsor knot. Why are Windsor knots so bad? Compared to the standard four-in-hand knot, they are too big and too symmetrical. As a result they appear ostentatious. 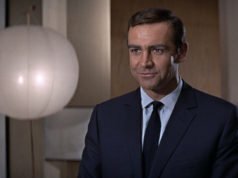 In the films Bond typically ties a four-in-hand knot, though he uses the Windsor knot in Dr. No, On Her Majesty’s Secret Service, and Diamonds Are Forever. I do hope you're simply trying to explain Fleming/Bond's assertion, not endorse it, because the idea that there's a single, "right" way to tie a tie is simply absurd. At a purely objective level, the Windsor knot need not be larger than the four-in-hand, depending on the tie and the tightness of the knot. 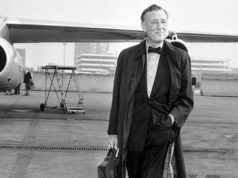 As regards the argument implicitly linking the Windsor's symmetry and supposed ostentation with caddishness, one might as well argue that a four-in-hand knot represents a louche, careless fellow — a slob, in fact. But to engage in such a counter-argument would be to buy into the petty, bourgeois mentality which is, alas, endemic to the Bond books (their lean, strong writing and considerable charm notwithstanding). Someone’s got an axe to grind. I don’t think that Flemming or Bond are suggesting that there is only one way to tie a knot. Rather Flemming is saying his character Bond, believes the knot to be an indication of vanity. It is the size of the knot that often comes under criticism, and is I believe the distinguishing feature. The Duke of Windsor used large ties to achieve large knots. The Windsor knot was meant to imitate this look. I am not sure how Bush comes into play. Wait, you’re joking. Nevermind. I've never understood the hatred towards the Windsor knot, especially on StyleForum. It is the knot I've always used and always will. So that’s where the famous remark came from. I don’t have the book myself ; if you do, Matt, could you tell me whose character Bond is looking at / thinking of when making that remark, please ? Is it Donald Grant, or simply another character ? And the description above, is it Grant too ? Thank you.